Continuing our extensive review of the best water softeners, we’re turning our attention to finding the perfect water softener system for well water. We’ve listed the 4 top hard water models and the 3 salt free options and the 3 to use when your water has iron in it. We also checked out the top products for the whole house. Some of the units include Fleck 5600 SXT Water Softener Ships, Eddy Water Descaler, ABCwaters Pentair Fleck 5600 SXT, and Fleck 9100 SXT Twin or Dual Tank. We’ve rated each model for its efficiency, expected life, cost, maintenance needs, and ease of use. You can read our evaluation of what we’ve found to be the perfect product or learn about the factors you should take into account when choosing your own new water softener. Click the link to check the price on Amazon.com. We got a team of evaluators and tried a number of products from different brands to see which will give peak performances according to specific purposes. We also logged in the number of hours that we spent in testing the models. These are our favorites. We’ve arranged the list with well water softeners that are specialized in some way (iron removal, salt-free) at the top with the more generalized models following. We’ve included the grain capacity and price for each model and their features. If you’re looking for products for this purpose, these 3 models are what you need to be looking at. All of them are high-quality choices effective at not only removing regular hard water grains but also iron. The second two also remove sulfur. If your home operates on a well, there’s a high chance that you have a significant amount of iron in your water. Iron discolors tubs, sinks, and clothes worse than the regular calcium and magnesium grains. Regular water softeners will help, but if you really want to stop the iron flowing through your pipes, try the ABCwaters built Fleck 5600 SXT 64,000 Grain Water Softener with Iron Mesh. It is one of the perfect units to begin with, even without the iron removal specialization. The specially licensed control head features our favorite Fleck valves. The 5600 SXT series monitors the amount of water being processed through the resin filter and triggers a regeneration cycle as it nears its grain capacity (64,000 grains in this case). The large grain filtering capacity provides an economical use of water for familes of up to 7 people. Less family members means even fewer regeneration cycles and thus less water and salt wasted. You can adjust how often the water softener regenerates by keeping an eye on your water and turning the GPG setting up or down. Small adjustments will keep your water clean while conserving more it. With the power to provide 13 gallons of softened, iron free water every minute, you’ll never experience a lack of water pressure in your busy home. The difference with this model, part of the Iron Man Series, is that the resin mesh is finer so that it’s able to filter iron and larger hard water grains. With a 64,000 grain capacity capable of regulating itself and regenerating as needed, this is truly great ones that you can buy. The Fleck control valve comes on this model comes with a 5-year warranty. Both the brine and resin tank come with a 10-year warranty. You can purchase other Iron Man Fleck models with lower grain capacities, but the larger size will prove to be the more economical choice in the long run. It’s comes with an easy installation kit. The ABCwaters built Fleck 5600 SXT 64,000 Grain Water Softener with Iron Mesh even comes preprogrammed to save a little more time, but you can easily change the settings if needed. It’s one of those available at the most affordable price. Released as an improvement on their Iron Pro series, the AFWFilters New Iron and Sulfur Filter Pro 3 5600 SXT 64,000 Grain Water Softener helps to remove the eggy sulfur smell that some water carries. Water that stains everything orange and smells like hardboiled eggs is almost unusable. If it carries both, the Iron and Sulfur Filter Pro 3 will take care of both. It has the same grain capacity as the ABCWaters model above, meaning that it will filter 64,000 particles of hard water mineral grains before it needs to regenerate, or flush the filter with salt water. It also features a Fleck 5600 SXT control head and valve. The Fleck SXT valves automatically trigger a regeneration cycle when your home’s water use approaches the 64,000 grain setting. The frequency is determined by how many grains per gallon you’ve programmed into the control head. A lower GPM estimate allows more gallons of water to flow through the tank while a higher GPM triggers it flush more frequently, providing you with cleaner water. The AFWFilters New Iron and Sulfur Filter Pro 3 also has a fine mesh resin for filtering iron particles. In addition, it has KDF-85 added to the resin to remove sulfur and manganese. If you’ve ever seen a black, slimy stain in your shower, dishwasher, or sink basin, you’ve seen manganese in your water. With a high grain capacity regulated by a Fleck SXT valve, the ability to remove sulfur and manganese, and a flow rate of 16 gallons per minute, the AFWFilters Pro 3 is a great model available. It comes with a 4-month money-back guarantee. The Fleck 5600 SXT 48,000 Grain Iron & Sulfur Eradicator 2000 is made by Fleck itself, so you know it’s going to be a high-quality water softener. It perfectly filters hard water that has up to 50 grains of minerals per gallon. That will take care of some very hard water. We do wish that it had a higher grain filtering capacity though. In a home with hard water, iron, and sulfur-rick water, this model might be used by families of 2-3 people. It does feature the 5600 SXT control valve common to all of these units. If you know or have accurately estimated the grains per gallon in your water, you can set the SXT to regenerate as needed. It will use the gallons per grain you program into it to automatically perform regeneration after processing so many gallons. The Eradicator 2000 also comes with a fine mesh resin to filter iron. Added KDF-85 Mediaguard helps to filter sulfur and manganese. Calcium, magnesium, iron, sulfur, and manganese will all be captured and flushed away into your septic system. The Fleck Eradicator 2000 comes with the standard 5-year warranty on the control head and a 10-year warranty on both the resin and brine tanks. That’s a little steeper than the ABCwaters Fleck model for less grain capacity, but you’re also getting iron and sulfur removal in this model by the original manufacturer of the industry-standard valve system. For a fair price, mineral, iron, and sulfur removal, we’re confident in calling this one of the top water softeners for water with iron available today. It’s easy to install and comes with all the connections you’ll need. If you want to skip the salt and save on water consumption, these are the three rated salt free water softeners options available on the market. Salt-free water softeners are used with well water that isn’t too hard. If you have very hard water but still want to use a salt-free softener, consider using a combination of these options or couple them with a magnetic water softener, such as the Magnetic Water Technology Two-Unit Combo. This is the Hard Water Bullet Poly Softener. It’s different from a conventional water softener in that it does not remove hard grains from your water. Instead, it crystalizes and coats the grains in polyphosphate so that they don’t stick to your pipes, sinks, tubs, hair, and clothes. Polyphosphates are used in city water treatment facilities and pose no risk to your health, to your appliances, or your plumbing. It does have a 30-micron filter to catch sediment and provides 30 gallons of softened water per minute. The Hard Water Bullet connects as a pass through onto your water supply line. Weighing only 4 pounds with a 9” x 10” profile, you’ll hardly know it’s there. Just bolt it to the wall with the bracket, and save yourself some floor space. The Hard Water Bullet Poly Softener is greatly made and durable. To care for it, simply turn your water supply valve off, run a faucet until the line is empty, and unscrew the softener’s lid. Remove the filter and rinse it in a washtub while you flush the core with a vinegar solution. You’ll also need to re-fill the Hard Water Bullet with polyphosphates every 6-12 months. Adding polyphosphates is an easy task. Simply turn the water off and empty the water line before unscrewing the lid and pouring in the polyphosphates. 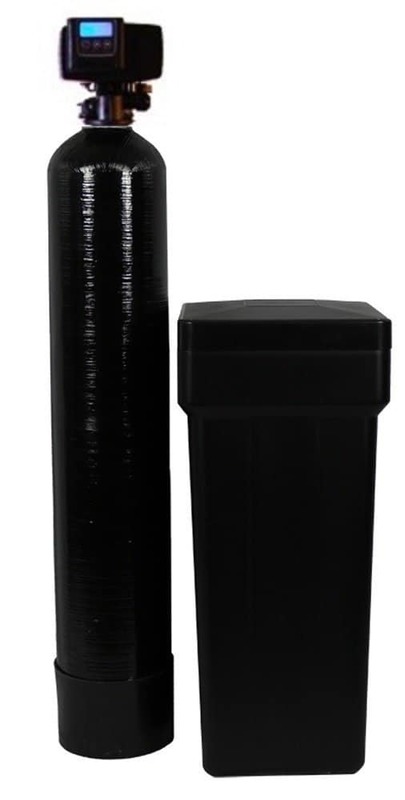 You can purchase the Hard Water Bullet Softener Poly at a relatively low price. Its effectiveness in softening water, along with its maintenance needs and a low price make this model the a top choice. Note that this water softener won’t help with iron or sulfur though. If you have softer water or want to add one of the other salt-free water softeners to your supply line, you might enjoy the Aquasana Whole House Water Filter and Salt-Free Softener. Like the Hard Water Bullet, this Aquasana model crystallizes hard water grains so that they’ll flow harmlessly through your pipes and drainage system. It uses no water to flush itself and no salt. It is an in-line water softener and filter that yields 7 gallons of soft, clean water per minute. That’s a high enough flow rate for a family of 3-4 people to never experience low water pressure, even when running two showers, a washing machine, and a kitchen faucet at the same time. The Aquasana Whole House Water Filter and Salt-Free Softener’s price might seem high but it is guaranteed to last 10 years or to process 1 million gallons of water. That’s a total yearly cost of a whole lot of water. You will, however, also need to replace the water filter every six months. You can purchase 4 replacement pre-filters (10-inch) and 4 replacement post filters (20-inch) cost very cheap. The SimplySoft polyphosphate material should be replaced approximately every 5 years. Despite its higher initial price tag and filter replacement needs, the Aquasana Whole House Water Filter and Salt-Free Softener remains one of our top picks. It is effective at removing hard water grains and filtering sediment from pumps. It is not effective for iron or sulfur control. The Eddy Water Descaler is a surprisingly effective water softener for well water. It is a small unit that plugs into a standard 110-volt outlet and softly clamps onto your hot and cold water supply lines. The box and coils deliver an electro-magnetic wave to passing water, suspending the grains in the water until they eventually exit your home through the drainage system. Because it is not even a pass-through system in your supply line, it does nothing to hinder your plumbing’s flow rate. There are no filters to change and no chemicals to add. It’s also the least expensive models. If that weren’t enough, the Eddy Water Descaler comes with a lifetime warranty. If you have particularly hard water, you can add the Eddy to a Hard Water Bullet Poly or an Aquasana water softening system for added effectiveness. Because homes with hard water will have calcium and magnesium deposits built up in their pipes, you should give the Eddy Water Descaler a month before judging its performance. It might take that long to clear your pipes of past mineral grains and show the true effectiveness of the electro-magnetic technology. The Eddy Water Descaler does run continuously, so you might see a slight increase in your energy bill. The amount, however, is negligible compared to the cost of salt, water consumption, and electricity needed to run a conventional water softener. For its effectiveness, low price, long warranty, small size, and minimal energy costs, the Eddy Water Descaler is one of our top picks for salt free water softeners. Once again, however, this water softener will not help with iron or sulfur in your well water. These are conventional water softener options. The main differences between them are grain capacity and price. The Fleck 5600 SXT 64,000 Grains is another model by Fleck itself and is one of the great products that you’ll find. The high grain filtering capacity ensures that it can go 5 or more days without regenerating even in homes with very hard water. The Fleck SXT control valve measures your home’s water flow rate and ensures that it regenerates at just the right time. The control valve also features a back-up power supply that prevents the control head from losing its settings and memory in a power outage. The back-up capacitor keeps it charged and operational for 48 hours. After that, it’s a simple task to reprogram the head and trigger regeneration, ensuring that you won’t miss a cycle. Like all Fleck SXT’s, the valve keeps tracks of the gallons of water it processes and triggers an automatic regeneration cyclebased on the grains per gallon you’ve programmed into it. If your water still seems hard after installing, increase the grains per gallon setting to allow it to regenerate more often and clear your water of any pass-through minerals. The flow rate for this model is 18 gallons per minute, one of the highest flow rates you’ll see in an in-line model. The Fleck 5600 SXT 64,000 Grains comes with a full replacement warranty of 5 years on the SXT control head and valve and 10 years on both resin and salt tank. The actual lifespan is expected to be 20 or more years. Its low price with high grain filtering capacity makes this one of the top water softeners for hard water that you can buy. Note, however, that this model is not designed to filter iron or sulfur. When you need even longer intervals between regeneration cycles or want the water to keep flowing during a regeneration cycle, the Fleck 9100 SXT Twin Tank 80,000 Grain Water Softener is a smart choice. The twin tanks ensure that you’re never without soft water. Each tank filters 40,000 grains of hard minerals. As they reach their filtering capacity, the 9100 SXT control valve triggers one tank to regenerate and then the second when the first is finished. A single-tank water softener can’t process water while it’s regenerating. Having two tanks allows your system to continue processing water through one tank while the other cycles. This SXT model also features the anti-memory loss back-up power capacitor common to 5600 models and above. It remembers how many gallons you’ve used and when the next regeneration cycle should be up to 48 hours after your power goes out. The flow rate is 22 gallons per minute. That’s enough to supply a small business, and, in fact, we do recommend this as a commercial model. You can take advantage of commercial power and capacity at home. The 80,000 grain filter capacity will also save you money by regenerating less frequently, less than once per week in most cases. The Fleck 9100 SXT Twin Tank 80,000 Grain Water Softener comes with a 5-year warranty on the 9100 SXT head and a 10-year warranty on all tanks. You can install it as easily as a single-tank water softener and will enjoy just as few maintenance needs. With the highest grain filtering capacity between regeneration cycles, a reasonable price, extremely high water flow, and alternating regeneration tanks, this is definitely one of the top water softeners for hard well water. Going down in capacity and a little in price is the Fleck 5600 SXT 48,000 Grain Water Softener. This is our favorite water softener overall and might be the product for hard water well water if you have a smaller family. Its filtering performance is just as high as a 64,000 grain model, but regeneration will take place more frequently in a busy home. Even if you do have a larger family, its flowrate of 12 gallons per minute ensures that it can keep up with 3 showers, a dishwasher, a laundry machine, and two sinks running at the same time. It would simply need to regenerate more frequently and thus use more water and salt than a higher grain model. For reduced costs, we recommend using this model in a home with fewer people or only slightly hard water. As a bonus, this model comes with a USB drive detailing installation instruction, programming the control head, and how to care for your water softener. It even comes with a water test kit so that you’ll have a better idea of what to input as the grains per gallon. The control is covered by the standard 5-year warranty and the salt and resin tank for 10 years. You can purchase the Fleck 5600 SXT 48,000 Grain Water Softener and get an expected 27-year lifespan. This is the water softener for hard water in smaller family homes. Note that this water softener does not filter iron or sulfur. The mid-priced ABCwaters Pentair Fleck 5600 SXT 80,000 Grains with 10% Resin provides the higher filtering capacity of the twin-tank model in a single tank. You won’t need to worry about the 10% resin upgrade in homes with well water (it helps preserve the life of the resin in chlorinated city water), but you will enjoy the savings of less frequent regeneration cycles. This is the highest grain filtering capacity you’ll find in a single-tank model. It features the improved Fleck 5600 SXT control head that can last up to 27 years. It’s guaranteed for 5 years in case of manufacturing defects or early failure and the tanks are guaranteed for 10 years. It doesn’t have the alternating tanks like the twin tank model, so you’ll have to wait for softened water until it’s finished running its regeneration cycle. It does, however, keep track of your water usage and will run the regeneration cycle at a typically low usage time (usually in the middle of the night) before it reaches its filtering capacity. As an added bonus, you can purchase this model in blue, black, or almond to blend in or appear more attractive in finished basements. It also comes with video instructions for installation and programming. Follow along and complete the job in a couple of hours. The ABCwaters Pentair Fleck 5600 SXT 80,000 Grains with 10% Resin is available with such a long lifespan and infrequent regeneration cycles. It’s one of the top water softeners for hard water. Unfortunately, it doesn’t help with sulfur or iron. Assuming that you don’t also have problems with iron and sulfur in your well water, the one that you can buy for the price is the Fleck 5600 SXT 64,000 Grains. It’s built by Fleck with a Fleck 5600 SXT metered valve and control head. It has a high grain filtering capacity to limit regeneration cycles and a back-up power capacitor so you don’t lose your settings in brief power outages. It has a flow rate of 18 gallons of water per minute, meaning it can fill your hot tub, run 3 showers, and every sink and appliance in your house without a problem. It can reliably last more than 20 years. Why wouldn’t you buy this model? It’s the perfect whole house water softener for well water. The Fleck 5600 SXT 48,000 Grain is the top unit for its price. Once it’s installed, it will run itself with automatic regeneration cycles and continue to provide you with a 12-gallon per minute flow rate. The resin filtering system is the most effective at removing hard water grains, and the salt flush periodically cleans the resin. You don’t have to perform any maintenance other than checking the salt level once a month. It comes with instructions for easy installation, and will most likely last more than 20 years. You can also check out other options here. How to Pick the Right One for Your Needs? When you’re looking for the top product, you also don’t want it to cost more than it needs to. We’ll help you decide what you need in a water softener to meet your home’s needs. Conventional water softeners are rated by grain. Your source supplies water that contains hard water “grains” or mineral particles of calcium, magnesium, and others. A conventional water softener will state how many grains it can remove before it has to regenerate. What is the regeneration cycle? Regeneration is when the salt water rinses the filter of mineral grains so that it can continue filtering. The salt is then rinsed with fresh water, sending the minerals and salt safely away into your septic system. What grain rating do you need for your home? That depends on how hard your water is (how many grains per gallon it contains) and how many people live in your home. To determine the hardness of your water, you can either test your water or estimate its hardness by the effects it leaves on your plumbing, basins, appliances, and clothes. Your water might contain as high as 40 grains per gallon. City water contains an average of 15 GPG. If the average person uses 80 gallons of water per day to shower, do laundry, wash the dishes, wash their hands, and cook, you can multiply that number by the number of people living in your home. A four-person family, for example, will use 320 gallons per day. That means that their water softener would need to filter 12,800 grains of hard water minerals per day. Now comes the question of regeneration. How often do you want your water softener to regenerate? It will use approximately 30 gallons of salt and fresh water as it rinses the resin (the filtering material). Purchasing a water softener with a higher grain capacity will ensure that it regenerates less often, saving you money on water usage and salt over time. You can tell if you need a water softener with a higher grain capacity or need to increase how often your water softener needs to regenerate by paying attention to the following signs. You’ll also want to note the flow rate of each water softener. The flow rate is how many gallons of water they can supply per minute. A shower needs 2 gallons of water per minute, a dishwasher or washing machine 1.5, and a faucet 1. Running any of them simultaneously requires adding the water supply demands together, so running the shower and a washing machine at the same time would take 3.5 gallons per minute. You can combat hard water by purchasing a water softener with a higher grain rating and increasing the estimated grains per gallon you program it into it, signaling it to regenerate at the appropriate time. The number of people in your home who need to use water at the same time will determine how high of a flow rate you need. You typically want a minimum of 4 gallons per minute (GPM) with an additional 1-2 for every person. 4 people = 7 GPM, etc. Besides mineral grains in your water, you might also have iron creating orange stains, sulfur smelling like hardboiled eggs, or manganese leaving black stains. Be sure to select a water softener specifically designed to combat these problems. To filter out iron, sulfur, and manganese, a water softener needs to have additional material in the resin tank. KDF-85 is what you need for filtering these troublesome elements. It also controls algae and bacteria that might be present in your water. Water softeners function in different ways. Conventional models will be excellent for hard water, but if you have naturally softer water or want to combine smaller water softener models into a system, you could use the salt free options. Small beads called resin filter mineral grains out of your water. Salt water cleanses the beads when they reach their filtering capacity. The models we have selected as options range in price. Salt-free water softeners can be electronic, magnetic, filtering, or coating. Electronic and magnetic options suspend hard mineral grains in the water so that they pass through your pipes and drainage system. Electronic models use an electro-magnetic wave while magnetic options use hard magnets. These range in price. Filtering water softeners crystalize mineral grains, stopping them from sticking to pipes or other surfaces. Coating softeners also crystalize the grains but then coat them with polyphosphate for additional effectiveness. Filtering and coating models require filter changes or added chemicals and range widely in price, but you can see the cost of our recommendations below. Just because you might have learned how to live with water scale doesn't make it a good idea. The residue of scale causes a lot more problems than people realize. It starts out when you notice that pale, white residue that sticks inside your tea kettles or cooking pots after you've boiled water, and it also shows up inside the coffee pot. That is actually the residue of mineral deposits that are slowly starting to block the pipes in your plumbing throughout your entire home. It's mainly calcium and magnesium bicarbonate, a chalk-like substance. Hard water will also leave lots of stains in your sinks that are very hard to clean unless you use a highly acidic solution like vinegar. It also stains glassware very easily, and it will eventually make the glass become more brittle and fragile by "aging it" so that it breaks with very little effort. It will make both your skin and your hair start to feel more dry and itchy because most soaps and shampoos can't completely remove the mineral deposits that settle on your skin. That's why many people with hard water get more skin irritations, blocked pores and more breakouts. The scale buildup is actually clogging your pipes, and you'll gradually get more plumbing problems as the pressure inside the pipes prevents water from flowing as fast and smoothly as it should. These plumbing problems become serious quickly. Limescale that collects around the valves of your washing machines and dishwashers stops the valves from closing and creates leaks, so your appliances won't last as long as they should. Even worse, your bills will begin to skyrocket because your pipes have to work so much harder to get a good flow through them. Call your local utility company to analyze it and find out how "hard" the water really is in your home. Then you'll know which kind of unit you need most. The Popular Types Used and How Does It Work? There are many types of options our there. Here is a brief description of how each one works and the reasons why you might want them, along with the price of our favorite models in each category. See our more complete evaluation of each model in the next section. These appliances use resin beads to filter incoming water and then regenerate the resin with salt or potassium. They are still the most effective at removing mineral grains and come in a variety of grain filtering capacities. The following options are all resin and salt-based. Single-tank downflow: The standard. Ex. Fleck 5600 SXT 48,000 Grain. Single-tank upflow: More efficient. Ex. Fleck 5600 SXT 48,000 Grain with Upflow Carbon Filtration. Alternating twin tanks: Ensure 24/7 supply for busier homes. The Fleck 9100 SXT 64,000 Grain. Compact combinations: The resin and salt tanks are combined into one unit for smaller homes. GE, Morton, and Whirlpool all have high-quality options. Both of these solutions function by magnetizing the water passing through your supply types. Electronic systems send an electromagnetic wave. Magnetic systems rely on magnets changing the physical properties of the passing water. Neither removes the mineral grains from your water. Instead, they keep the grains suspended so that they pass back out through your drainage system without clinging to pipes or other materials. Electronic and magnetic softening systems are suitable for homes with pre-treated supply or as additions to conventional models. These salt-free solutions are small and easy to install on the outside of your pipes. They include the following types. Electronic: Plugs into a standard 110-volt. Ex. Eddy Descaler. Magnetic: Does not use electricity. Ex. Magnetic Technology Two-Unit Combo. These options alter the physical properties of the minerals in your water, transforming them into crystals, or coat them in a poly-phosphate so that they pass cleanly through your pipes, appliances, and drains. Full filters will also remove chlorine and chloramines as well as herbicides, pesticides, bacteria, and viruses from well water. We recommend most filter systems for homes. By removing chlorine, they will help you get softer skin and hair, while also conditioning your water for any remaining mineral grains. Filter systems include the following. Coating: Ex. Hard Bullet Triple Action Poly Salt-Free. Because of the advancement of technology, it is quite easy to install your unit nowadays. But if you are a novice in the assembly, do not worry. All products come with instructional guides and complete manuals in placing them in your own home. Some even come with videos and USBs for the convenience of the consumers. Find the control valve to stop the flow of water to your home. Close the valve and check if there is any flow inside the pipe. Decide on the portion in which you will install the unit. Make sure that you are buying the right size for your house. Locate your meter and cut the pipe after it. You will install 3 valves on the line. One to hold it prior to the unit, one as a bypass for maintenance purposes, and the third one after the unit. Check all fittings that you connected. If you need to solder some parts, do so. Connect the tanks to be used. See if the tubing are already included in the package. If not you have to buy from your nearest hardware store. They have standard sizes so you need not worry about the measurements. ​A drain line is used during cleanup and maintenance. Connect it using a clamp. Connect the pipe from the unit to the line going to the inside of the house.